The process was originally developed to ensure soldiers' clothing remained impermeable to chemical weapons. The process - dubbed ion-mask by its inventors - works using a chemical based on the element fluorine. In a closed chamber, the chemical is vaporised and attaches, molecule by molecule, to all the fibres in a fabric. 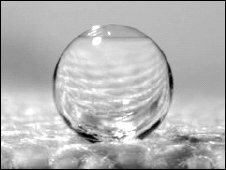 The chemical makes the surface "hydrophobic" or water-repelling, so that instead of water spreading out it forms droplets on the surface. The chemical coating covers just the fibres, rather than forming a "skin" across the whole surface, as with currently available waterproofing treatments. That means the spaces between fibres remain open and the fabric is still breathable. "The normal way in which you'd make a shoe waterproof is put a membrane inside the shoe; Gore-Tex is a well-known example," says Ian Robins, business development director of P2i, the company marketing the process. "That's effectively putting a plastic bag inside the shoe. No water gets inside your shoe, but at the same time that reduces the breathability both in terms of sweat and of heat escaping." The fabrics are also inherently stain-resistant and easier to clean, says P2i. 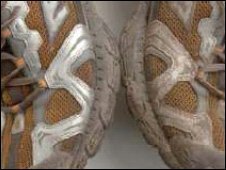 Dr Robins says coating a pair of shoes using the ion-mask process requires just a tenth of a gram of the fluorine compound, and costs in the region of a few dollars - significantly less than the cost of integrating membranes like Gore-Tex into a pair of shoes. It can also be used to waterproof outdoor gear. High Street outdoor equipment retailer Millets, owned by Black's Leisure Group, will be stocking the men's Hi-Tec ion-mask shoes in 75 stores. "This could change waterproof footwear as we know it," says Michelle Swan, a senior footwear buyer at Black's. She said the company would keep an eye on the "revolutionary" technology and perhaps use it in other areas of its business.